What would be a good size ic for a 4th gen? I also read, that for like intercooler an eBay bought one would be suffice, is this correct? Well for ~250 whp it should be fine right? How about the dimensions, though? Ebay is fine for that kinda power. For my "small" 6" tall IC, the first time I mounted it I didn't cut anything on the bumper support, so it hung under the support, but I had to hack the shiiittttt outta the bumper and front lip. The second time, I started butchering the bumper support, took a solid 2" outta it (that took about a day by itself, that metal is thickkkk!!!) but the IC sat muchhh nicer in the bumper opening. Damn. Well there isn't one that'll sit well, without having to cut out any of my bumper support, huh? There's no way in hell your going to install a turbo and/or IC without cutting/trimming/modifying anything, it's just not gonna happen. Depending on the tools you have available, its muchhhhh easier to cut/trim the bumper cover than the bumper support. I guarantee you there's not a single IC out there where you won't need to cut/modify ANYTHING to get her mounted. And I'm all hoping nothing will have to get cut. Lol. But that's all ideal, right? Back to reality, alright cool thanks man. I'm just tryna learn as much as possible before I attempt this. It would be ideal to get it after march or something after I done the smog lol. But you still need to come up with (aka fabricate) some mounts to hold the IC which is gonna require some creativity. Guyan, you still had to do some cutting to the bumper cover correct? Shiet, lol. Your car looks clean man! And yeah, I'd rather not lol. I guess If I get a smaller intercooler I won't have to cut up TOO much lol. I'm just hella impatient lol. Being in college and tryna work on cars is a b*tch lol. Little money coming in, and finding the time to do everything lol. I THINK I've found the turbo charger I want, which in my opinion is probably the hardest part, but I'm not entirely sure. But then I wanna buy a jdm h22, ah so many decisions lol. 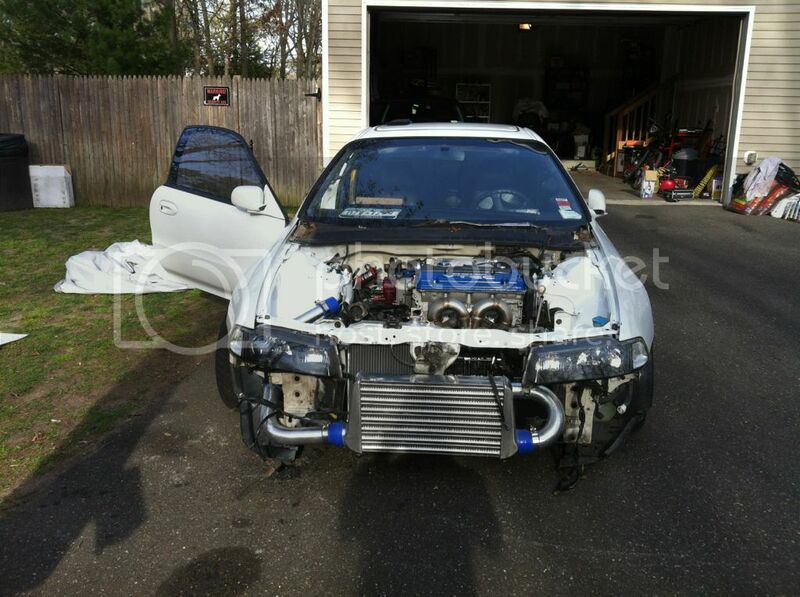 I hadn't seen this link before, I actuall yhtink I wanna get the intercooler piping, just that Idk if it'll fit for my car, or setup? cuz doens't it depend on how i place the turbo? Put a dsm smic right where the battery usevto be. Relocate battery. Easy , this is what I will be doubg.